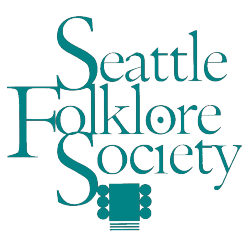 The Seattle Folklore Society was organized in the mid-1960s as an outgrowth of the increased awareness of traditional music in urban and college environments in the 1950s, which led to an unprecedented popularization of folk and folk-style music in the early 1960s. In the 1950s there developed an increase in interest in folk and traditional music in colleges, with many urban, educated performers who were introduced to traditional music through the work of ethnomusicologists and collectors, and through songs published in written collections and preserved on recordings. Some of the leading performers of this period who helped to popularize interest in folk music were Pete Seeger, Burl Ives, Bob Gibson, Guy Carawan, Sam Hilton, Theodore Bikel, and Odetta, to name a few. Most of these performers informed their audiences of the source of their material and, by the late ’50s, many persons introduced to folk music began looking at the roots of the music and presenting the “roots” performers as well as the “interpreters.” By the early ’60s, folk interpreters were climbing the pop music charts, and a very active circle of traditional music enthusiast were seeking, recording, and presenting the roots musicians in performances. By the mid-’60s, folk music was very viable commercially with many amateurs and professionals engaged in the activity. Reed College in Portland was a hotbed of traditional music activists in the ’50s and early ’60s, presenting many folk musicians in concert and providing an environment for many parties and informal gatherings of local folk musicians. By the late ’50s an informal group at Reed was booking as many folk musicians into the Portland area as were available, occasionally resulting in several concerts a month. Principals in these Reed activities were Robert Williams (brother of Phillip) and John Ullman. Seattle had an active group of folk musicians during the late 1950s who met regularly for informal song-swapping sessions and occasionally presented public performances. The opening of the Folklore Center in the University District by Gordon Tracie helped give a focus to this activity and, as its facilities expanded under the subsequent ownership of John Sharbinin, provided a place for regular gatherings. For the opening of the Folklore Center at the University District location (it originally opened in the Pike Place Market in 1955) in 1957, Gordon conducted a folklore festival featuring Fred McFalls and other local old-time and bluegrass musicians from the area’s North Carolina community who had not previously performed in Seattle. A Folksong club was organized, held meetings, and presented concerts, primarily of local performers. While Portland continued to have an active forum at Reed College for presenting roots musicians, virtually none were presented in Seattle throughout the late 1950s and early 1960s. John Ullman moved to Seattle in the mid-1960s, having coordinated many concerts at Reed, and noticed the absence of roots musician performances in Seattle. He mentioned this void to some of his friends at the University of Washington also interested in traditional music (primarily blues) and to some of us active in string band music. There was considerable traditional string band music in the Northwest, though most was presented outside the Seattle area. We discussed this situation, focusing primarily on the fact that many of the legendary roots musicians were nearing the end of their careers and we would not have an opportunity to see them unless we arranged to bring them to Seattle. And, we could not continue to enjoy their art unless an effort was made to document them. Videotaping was a relatively new medium and appeared to be ideal for making a documentary. John Ullman approached the University of Washington Ethnomusicology Department and KCTS-TV and received indication of interest in a documentation program. This program was undertaken by KCTS on videotape and Dr. Garfias, enthomusicologist on film. As a start, an initial budget of $400 was raised from twenty contributors. John Ullman and Phillip Williams incorporated the Seattle Folklore Society as a non-profit, membership cooperation. The first concert was a financial success and the organization found it could present traditional music and stay viable. For the first few years of its existence, the Society was operated as substantially a closed organization whose sole purpose was to bring roots musicians to Seattle, present them in a public concert, and make audio, video and 16mm film of them. With the exception of a few benefit concerts, the Society had a policy of presenting no local performers, and only traditional musicians in the folklorist sense. One of the early policy discussions involved whether the Society should sponsor a concert of the New Lost City Ramblers, as even a group as close to the “original ethnic” as this was outside our customary presentation. In the 1970’s the scope of the Society was broadened considerably by active solicitation of members, increased membership activities, the founding of the Northwest Regional Folklife Festival, opening of the Folkstore (founded and originally owned by Thane Mitchell), founding of the SFS Journal, establishment of an archive program under a qualified archivist (John Ashford), and the founding of a clubhouse.